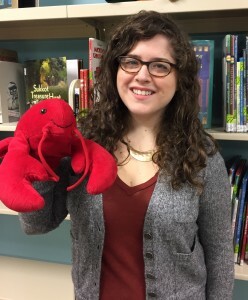 I am a children’s librarian in a very busy library, where I help our young patrons find information for school projects as well as their next favorite book. I plan programs for multiple branches, ranging from lapsits and preschool story times to events for elementary school students. I also visit district schools to promote various library services, most recently in the form of visiting kindergarten to talk about library cards. 1) What are some things you like about your job or about working in libraries in general? During the aforementioned kindergarten visits, I received a lot of very specific questions about the kinds of books we had at the library, and what would happen if we didn’t have a certain book, and a number of other questions in this vein that only five-year-olds tend to ask. Eventually their teacher announced, “Listen, if they don’t have it, they can get it for you.” And that’s really the core of what we do, isn’t it? If you want to learn something, I can help you find out about it. If we do not have that information onsite, I can get it for you. It is literally my job and my priority to connect you with that information. I love being able to help people follow their passions. As a bonus, since I work with children, these passions are usually topics such as Legos, princesses, trains, and the latest Diary of A Wimpy Kid book. 2) What’s a project or committee you’re working on right now that you’re excited about? I am really excited to do work as a member of NMRT’s Membership Promotion, Diversity, & Recruitment Committee. We are reaching out to library schools to connect with students interested in future roles within ALA. I feel incredibly lucky to have known someone already involved in the organization, otherwise I might have never gotten involved nor ever known about NMRT fresh out of school. I think it’s important to connect new librarians to an organization that is there to help them. 3) What got you interested in libraries? I have always been drawn to connecting people to information. In undergrad, this took the form of a major in communication with a focus on PR, but something did not feel quite right about that career path. Later I realized I wasn’t interested in connecting people with just any information, I wanted to help them find information in which they were interested. I was drawn to libraries, and public libraries specifically, because the access to information is free and open, giving everyone a chance to learn whatever they want. 4) What is one of your favorite things about NMRT? Being an NMRT member really opens doors for new professionals. I was clueless but interested in being involved with ALA right after graduating from library school two years ago, and being introduced to NMRT really helped clear a lot of that confusion. I love that being a member of an NMRT committee really means being part of a team. This is my second year working on a committee, and I have gained an enormous amount of valuable experience and have had opportunities to meet and work with people I otherwise never would have met. 5) Do you have any advice for other new librarians? Yes! Dare greatly, new librarians. I often hear things like, “I would love to do X but I am not sure about myself/I am so new/I am clueless.” Do not talk yourself out of opportunities, especially if it stems from a fear that you are too new, not ready, or not good enough. After all, how else can you learn something if you do not try at all? We are in need of more NMRT Member of the Week nominations! Want to be our next member of the week? Know another new librarian who deserves to be in the spotlight? Fill out our nomination form here!